Sounds are visually expressed by their wave’s shape showing the sound frequencies variations. That is the way a picture translates a sound and therefore a sound can also translate a picture. the sound designer sculpts the noise as to obtain a bright sound. Sound design is the art of sound sculpture. It can be a long and hard work before obtaining the surprising bright sound without any common point with the noise it comes from. We won’t expose the long steps between basic noises to the surprising sound effect but in the flash version of this article you can appreciate a sound translation of a simple shape. 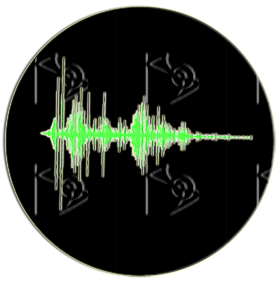 By clicking on the dark sphere, a black circle will appear with the corresponding sound, demonstrating how computer interprets a picture in an acoustic way. A static image can translate a sound, but it hardly expresses its rhythm, its own moving through time. The rhythm of an animation can be synchronized with a sound rhythm. We just have to configure animation variables such as wiggles or resizing in function of sound amplitude. On a sound rhythm, an animated object seems to change its size, its orientation, a smoky cloud seems to evolve, its brightness, its complexity seem to change. We do not just animate picture, we also animate sounds and let pictures come to life on this sound rhythm. We create ours sounds ourselves, we are sounds author and have reserved rights on our creation. The animation, presented in the flash version of this article, appears by clicking on a cube. It has been configured on a basic composition with, as an acme, an artificial voice pronouncing our brand’s name.